She had a really bad UTI when we discovered the stones, and we were trying to get it cleared up before we operated. But she developed a perforated stomach ulcer and died before we could get the stones out. 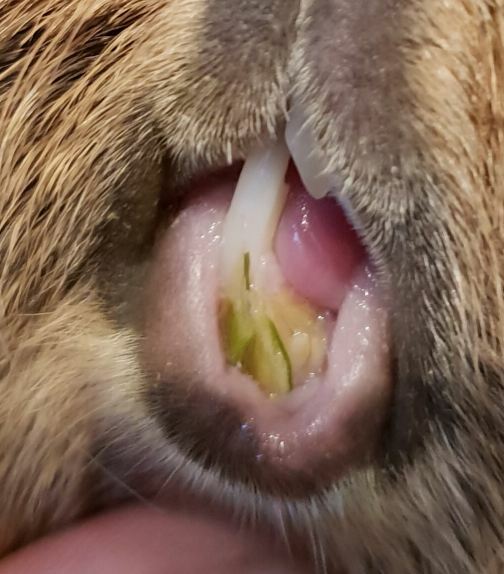 One of my girls have had this weird greenish coloured layer at the bottom of her lower teeth. I'm not sure what it is, or how long she has had it. I'm pretty sure she didn't have it last time I had her to the vet for problems with her teeth. One of the bottom teeth broke off a little while ago. It broke, and she had an infection of some sort and stopped eating. I found out something was wrong pretty quickly and took her to the vet. They sedated her and removed the tooth that was broken off. Since then she has returned to normal, but the upper tooth, opposite the one that is missing, is of course a bit long at the moment. We are keeping watch, and hoping it will return to normal slowly as the bottom tooth returns. The discoloration is likely due to the infection. If that has been successfully treated, it should grow out. Keep in mind that there may be another loss of the tooth and regrowth as it is establishing itself as a healthy tooth. I imagine you have read www.guinealynx.info/teeth_broken.html ? It has some information that should be helpful to you. It appears there is only one upper incisor? Your pictures are very clear. Let me know if you'd like them added permanently to your thread for future readers. I had actually not looked at the link you are referring to, but I have read it now. She is still doing fine, but not always wanting to eat her carrots. It's not uncommon for her to not eat them, but I always get suspicious when one of them doesn't want to eat something they are given. Regarding her incisor, it is there, but probably not visible on the picture. I'm hoping that the length of her teeth will revert back to normal. Right now, her bite is not completely straight as it normally is. It is totally fine to add the pictures permanently. All my pictures may be used as reference to help others. It just strikes me though, that this subject about teeth might not be fitting under the title of this thread :) Would it be better to make a new thread about this subject? And now something regarding Abigail. Today I noticed my girl Abigail not really biting into her cucumber as normal. Normally she more or less attacks it, eating 3cm x 3cm x 3cm in less than 10 minutes. I think it might be a broken tooth. I had her out and looked at her teeth, and they actually looked really nice, even though she had a broken of tooth not that long ago. Then I gently pressed my nail against each of the four front teeth, and the lower right one seemed to be a bit loose. She normally bites a bit hard into my fingers, when she wants to return to their cage, but today she was more gentle with her teeth. This tells me she might be feeling pain when biting. She is still eating the cucumbers and peppers that we give her, but it's more slowly and gentle. Besides that, she also still eats a lot of hay and pellets, and she seems totally fine when I cuddle her. I added some crops of your pics to show the teeth better (I think the board software might be shrinking them to fit into the post). You could well be correct about some pain related to Abigail's tooth. Sometimes with a broken tooth, it needs to grow out once or twice to stabilize (there can be injury to the root that is healing). Do you think I should take her to the vet tomorrow? There's clearly something wrong with her teeth I think. She is still eating both pellets and hay, as well as some of the lighter vegtables like cucumber. I can tell she is being really careful when eating vegtables. We have had a problem with Nellie making this weird snorting sound when breathing. It's on off most of the time, and we think it's related to dust in her nose, or something like that. That is the best explanation we have had for it. Our vet recommended us getting a water atomizer for spraying the saw dust in their cage, and their hay. Should help bind the dust or something like that. She recommended using demineralised water for some reason, and I forgot to ask her why. Has anyone got any experience with something like this? Why is there sawdust in the cage? You don't want them on wet bedding, or they'll wind up with bumblefoot. Demineralized water can have less calcium in it, but don't use distilled water. You can use filtered water that you buy or filter yourself, or reverse osmosis water. 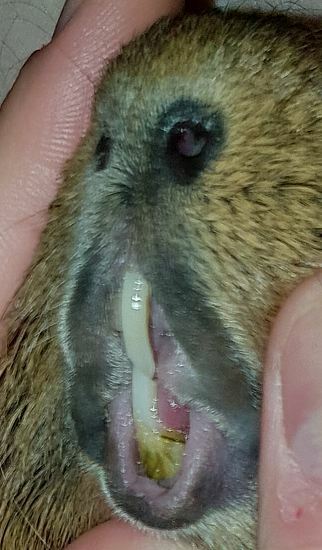 Ok bearing in mind I know nothing when I looked at the pics my first though was the green stuff I could see at the bottom of her mouth looked like a bit of finely sliced cucumber stuck in there. Or am I missing something? Bit of a novice here so just trying to work out what to look for with our 3 girls if they have issues. Looks like some kind of food to me. We have always used sawdust as bedding. We try to keep it dry, and remove it when it gets wet. A lot of the time there will be hay on top, since they get the hay for eating all over the place. Why is it so important to not use normal tap water? It sounds like one of your problems is the sawdust. Wood products should not be dusty or they can affect the respiratory tract. There are other low cost solutions for you. We have always used sawdust. It's not the very fine grained kind, but a very raw one. It's sold at a shop that sells hay, pellets and other related products for guinea pigs, rabbits, dogs and so on. Our Nellie is the only one having the problems as far as I can tell. It could also be dust from the hay I guess. I want to fix this somehow, but I need to figure out the best way to do so. I'm not really sure if what I'm writing is correct, but in danish there's only one word for sawdust, no matter how fine it is. What we use is more pieces of wooden leftovers from using a drill on a piece of wood. I will post some pictures tomorrow. I am interested in hearing about better alternatives of course. Perhaps they are wood shavings? They are on the "okay" list. What I encourage you to do is grab a bunch of bedding and put it in an enclosed bag. Shake and evaluate how much actual fine sawdust there is. You can also do that with the hay. Note on the hay page that hay that is moldy has very tiny dusty mold spores that make the hay smell funny and could affect your guinea pig's breathing. Wood shavings sounds more right. Here's a couple of pictures. Me holding some of it in my hand, and some pictures from the cage. Yes, definitely wood shavings and not sawdust.